There’s one weekend left to catch Confection by Third Rail Projects at the Folger. This immersive, multi-sensory theatrical experience takes place in the Folger’s Paster and Sedgwick-Bond Reading Rooms and explores themes of inequity, sweetness, and the human costs of culinary pleasures. Before we say good-bye to this extraordinary piece, explore how costume designer Karen Young created the look of this lavish feast for the senses. How did you come to work on Confection? I have a long history with Third Rail Projects and have already done several pieces for them, including Then She Fell. We have a really good rapport, and I have a sense of what [Co-Artistic Director] Zach [Morris] wants. For Confection, he came to me with a project concept and some visual references. He had visited the Folger’s costume storage and found some items that gave the sense of what we wanted—something historically flavored but a bit over the top. I then took that as a starting point and did additional research and fine-tuned the design to try to push the image into the ridiculous. Third Rails Projects company member Elizabeth Carena visits Folger Theatre’s costume storage. Third Rails Projects’ Co-Artistic Director Zach Morris explores Folger Theatre’s costume storage. Marissa Nielsen-Pincus. Confection. Folger Theatre and Third Rail Projects, 2019. Photo: Brittany Diliberto..
What kind of research went into Confection? Doing something in period is unusual for me, so I turned to a lot of sources to get a sense of the time: photos, books, films, etc. I paid attention to details that might refer to that world. It’s evocative of the Restoration, but still a loose interpretation. How has this show compared to other productions you’ve worked on? It’s pretty different! Most often I’m creating costumes from scratch, and a lot of the productions I’ve designed for have been more specifically dance-focused, which requires a different focus than theater. For dance, you have to consider movement and durability, and it’s more contemporary. For Confection, I had to consider the period, and I was using some things that were already created and modifying them—making them more decorative or adapting them so that they could be used for dance. We purchased some things and used some things from the Folger, which helped us get to know the organization. 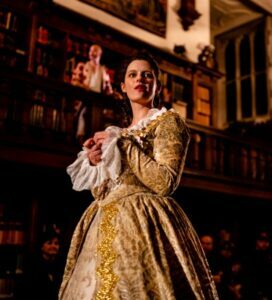 Julie Jesneck as Lady Reveller. The Gaming Table. Folger Theatre, 2012.Photo ©Carol Pratt. Elizabeth Carena in Confection. Folger Theatre and Third Rail Projects, 2019. Photo: Brittany Diliberto. What kinds of modifications did you make to the costumes? I decorated the costumes a lot to try to make the look a little over the top. I also created undergarments for all of the performers—corsets and breeches and loose shirts—that could provide a base for the other costumes they wear during the performance (and can be easily washed and danced in). That allowed us to layer, which is where a lot of the modifications came. The timing of a piece like this is very specific, and they have to be able to change quickly. To that end, a lot of the fasteners and laces were replaced by snaps and hooks to help aid the changes. I also attached some garments so they could be put on as a single unit, which also speeds up the changing process. Company members Elizabeth Carena and Alberto Denis. Confection, Folger Theatre and Third Rail Projects. 2019. Photo: Brittany Diliberto. The company of Confection, Folger Theatre and Third Rail Projects, 2019. Photo: Brittany Diliberto. Thanks to Karen for taking the time to speak to us and share her insights! There are still limited tickets to Sunday’s closing night performance and reception, with a standby line beginning one hour before each remaining performance. Visit the website or call the box at 202-544-7077 to find out more.